10" x 12" Rectangle; 10" Round. 1.25" x .042" x 11' 6". 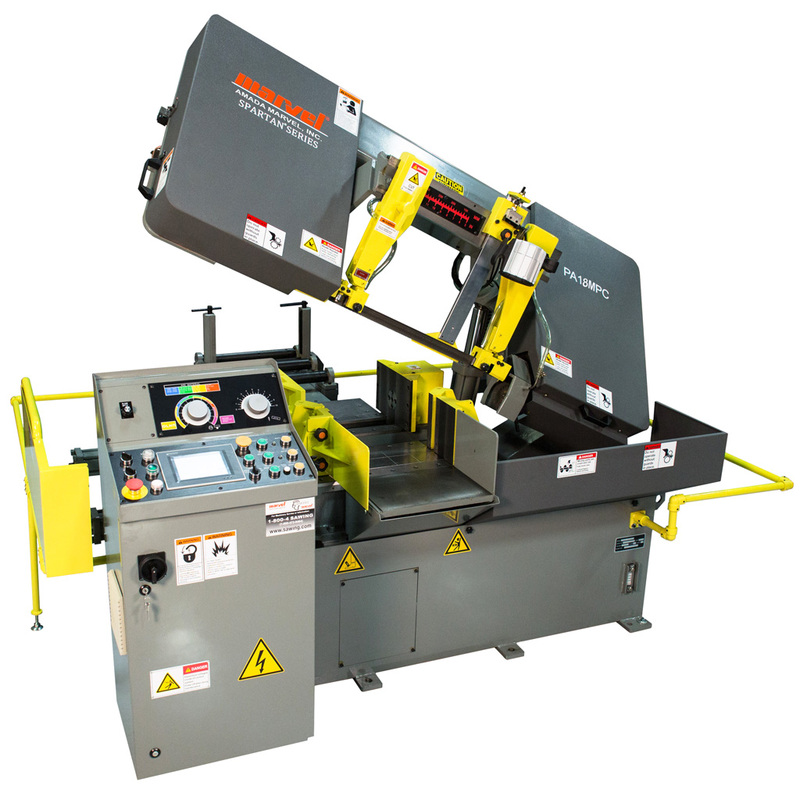 Hydraulically controlled tension (30,000 psi) provides consistent square cutting accuracy. Includes a motion detector that will shut the machine off should the blade break or stall. 70 - 330 SFPM variable through a frequency inverter drive and heavy duty worm gear transmission. The broad speed range allows for optimum cutting of a large spectrum of materials. Feed rate and down pressure can be controlled independently for fast, accurate cutting. Length settings of 0 - 16" are selected with a hand-wheel and displayed on a digital counter. The shuttle comes to positive stops at both ends of the index, assuring cutoff length accuracy. Repeatability is +/- .005 per index. Up to 9 cycles are possible using the multi-index system. Blade Drive: 5 H.P., Hydraulic Pump Motor: 1 H.P., Coolant Pump Motor: 1/8 H.P., Machines are available with either 230 or 460 Volt, 3ph., 60 Hz. Conveniently mounted on the left hand side of the machine and offers full control of all machine functions such as; Vises, Blade Speed, Saw Frame, bundle Clamping, Parts Counter, Shuttle Advance & Retract, Coolant and Work Light. The machine will stop the automatic cycle when the pre-set number of cuts has been reached. The machine will shut off automatically when material is no longer present in the rear vise. The combination roller bearing and carbide blade guides reduce heat and blade stress providing longer blade life and accuracies of +/- .002 per inch of cut material. Work Height is automatically set allowing the head to rise just enough to clear the workpiece, reducing the cycle time and allowing for faster cutting performance. The front vise jaws are split to reduce the remnant to as little as 2". The split vise jaws also help to reduce burrs left on the material and are ideal for bundle cutting. Holding the workpiece on both sides of the blade reduces vibration, providing more accurate cuts and long blade life. Rear Vise: The rear vise jaw floats hydraulically to accommodate crooked stock assuring straight, accurate cuts. Nesting fixtures for vertical clamping are designed for high-production multiple cutting of bundles and shapes. Vertically mounted hydraulic clamps located on each vise jaw apply downward pressure to hold multiple bar work or structural shapes. Replaces standard control console mounted to machine base with a free standing pedestal and 6’ flexible electrical and hydraulic lines (Special Order factory build). The coolant pan collects and returns coolant back to machine. Included is the pan, V-trough, and hangers.